I first met little Harper when her family booked me for her newborn session, she was just 4 days old and she was absolutely perfect. The most gorgeous skin, the chubbiest little cheeks and she was tiny. When her mom contacted me again to book her cake smash for her first birthday I was in complete shock, how could she be nearly 1 already? It’s complete madness how quickly time goes. When I saw them again for her cake smash session I couldn’t believe how big she had gotten, she was just as beautiful as I imagined she would be and she was just a pleasure to photograph. She was the happiest little lady ever, she found the entire thing hilarious and made the biggest mess because she just got stuck in and had fun. As Harpers birthday falls on Valentines day her mom requested a valentines theme but wanted soft pinks and creams so this is what we came up with! I struggled to narrow down her gallery because there was just so many lovely pictures. I have an amazing offer on at the moment for cake smash sessions! They’re a perfect way to celebrate your little ones first birthday or even any other birthday, if you’re brave and don’t mind getting covered in cake! 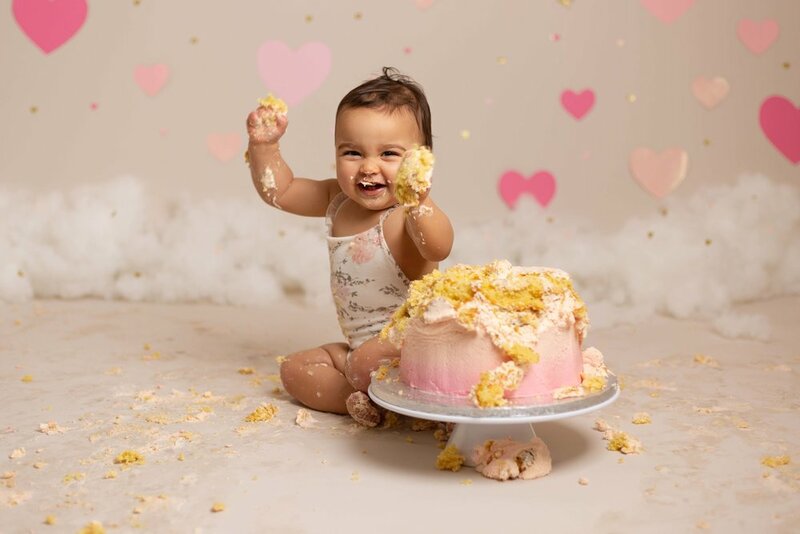 To book your little ones cake smash session please send me a message to check my availability, either by my contact page or via my facebook page on the links below.